Don't let the title deceive you. I'm not anti-grains. At all. Just on the selective side, maybe. If we were to play a silly hypothetical scenario game, a variation of which seems to annoy everyone at some point in their lives, and we were hard-pressed to name one meal we would be willing to eat every day for the rest of our lives, mine would be oatmeal, in a heartbeat. Our world abounds with nutritional philosophies, almost as much as it is struggling with obesity. Just for a point of reference, here's a brief on mine, so far, for now: I don't know enough to be too stubborn about anything...but Michael Pollan's Food Rules really do rule. Eat food. Not too much. Mostly plants. How can you really go that far astray? It seems few things are more individual than nutrition. There can't be a true one-size fits-all model. It all depends on your body, your needs. But there are some tenets that seem pretty clearly overlapping for everyone. Our guidelines are, try to keep as close to the source as possible; at home, we're really careful about where our meat and eggs come from, in particular, these days. Our budget doesn't stretch to all local and organic everything yet, so we prioritize with meats and eggs, and an eye on the "dirty dozen" lists for produce. We still have regular snacks that aren't ideal, but I take some comfort in them being largely homemade. I believe in moderation, even though it comes across as boring against the background of more exciting and revolutionary seeming trends. But back to the original point--I love grains. Possibly too much, I think. No matter where you stand philosophically on nutrition, chances are you'd agree most of us could stand to ease off grains a little, especially at certain points, depending on where you are in your training cycle, and other factors. And no matter where you stand nutritionally, chances are even greater that eating too many vegetables is not a realistic problem. So, I'm trying to make veggie snacking more of a habit, replacing go-to grains just slightly, and see where we go. Franziska Bishop, MS, a wonderful Longmont nutritionist emphasizes the impact presentation can have, as well as simple presence, when it comes to making healthy snacks alluring...for kids, but also for all of us. When the cookie jar is stocked, it's going to be convenient to dip into it, for instance. 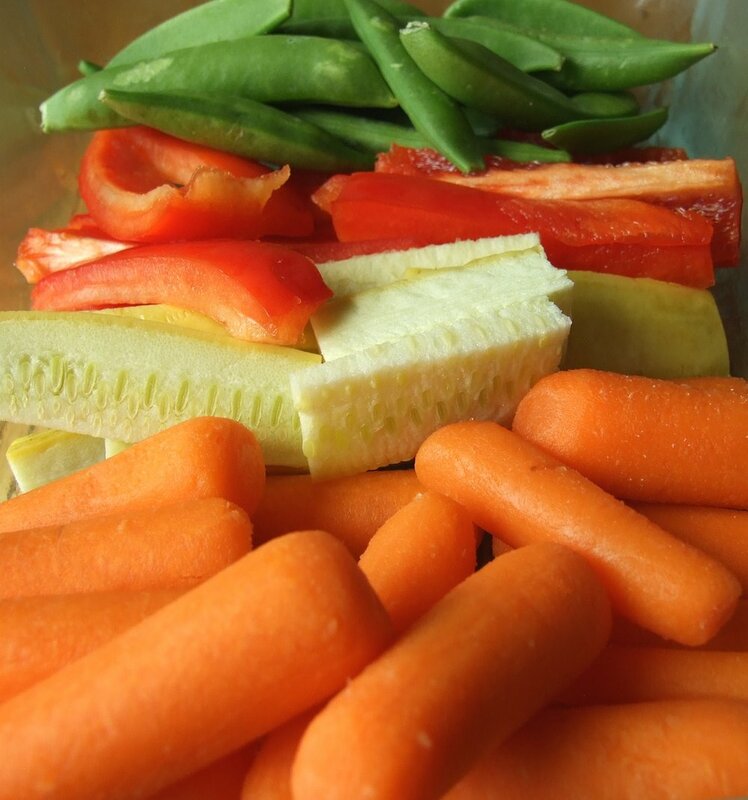 So we all know that the reverse works, too, and pre-cutting lots of veggie sticks on a Sunday makes them much more accessible for snacking throughout the week. Only, it is so nice to have a little extra punch to go with that allure. So I'm working on building the habit of: a) pre-cutting assorted veggies for zip locks on the weekend, and b) experimenting with and rotating healthy sides to go with them. Last week, it was this yummy, savory roasted eggplant and feta dip from Eating Well and a hummus-like roasted pepper and bean dip adapted from a great Joy Bauer recipe; this week, it's my favorite basic light hummus and tzatziki. Oh, and both weeks I've been enjoying "chips", too...they go surprisingly well with salsa, and also the eggplant dip. You may have seen them before...they're the ones I make for Riley. Remember I described them as natural dog treats you may even want to share yourself? Well, I am. In case you're wondering, Riley isn't getting short-changed by my dipping into his "biscuit jar". We've discovered he LOVES carrot sticks. He crunches them with the happiest doggie smile I've seen. Makes the nickname Fluff Bunny, which he endures with such man/dogliness, even more apropos. It takes a real star (which of course my floofy-faced, fiercely protective little guy is) to put up with that. I love tzatziki! Give it more of an Indian flair, along the lines of raita--replace the mint and dill with dashes cumin, nutmeg and cinnamon; add 1/2 cup chopped cilantro and 1/3 cup finely chopped red onion; replace the lemon juice with lime. Combine all ingredients in a bowl. Refrigerate to serve. Combine all ingredients in a food processor or blender and process to desired consistency. Position oven rack about 6 inches from the heat source; preheat broiler. Line a baking pan with foil. Place eggplant in the pan and poke a few holes all over it to vent steam. Broil the eggplant, turning with tongs every 5 minutes, until the skin is charred and a knife inserted into the dense flesh near the stem goes in easily, 14 to 18 minutes. Transfer to a cutting board until cool enough to handle. Put lemon juice in a medium bowl. Cut the eggplant in half lengthwise and scrape the flesh into the bowl, tossing with the lemon juice to help prevent discoloring. Add oil and stir with a fork until the oil is absorbed. (It should be a little chunky.) Stir in feta, onion, bell pepper, chile pepper (if using), basil, parsley, cayenne and salt. Taste and add sugar if needed. Remember the pretty tasty disaster that was my pinto bean burgers? I had such a surplus of cooked pinto beans, I got to have this veggie dip, another great Joy Bauer creation, too. It's a lot like hummus, and I used it the same way, such as in wraps. Process all ingredients to reach desired consistency. If you have a food dehydrator, then how easy this already simple snack must be! Spices to taste: try sprinkling with ginger, nutmeg and a dash of cayenne; garlic salt; chili and cumin. Wash and slice sweet potatoes ¼” thick. Place on cookie sheet; not touching. Brush lightly with oil or spray with cooking spray. Sprinkle with spices. Bake at 275 degrees for 90 minutes, turning once.